Animates the value of a Color Variable using an Animation Curve. The Color variable to animate. The curve used to animate the red value. Calculation lets you set a type of curve deformation that will be applied to the red channel. The curve used to animate the green value. Calculation lets you set a type of curve deformation that will be applied to the green channel. The curve used to animate the blue value. Calculation lets you set a type of curve deformation that will be applied to the blue channel. The curve used to animate the alpha value. 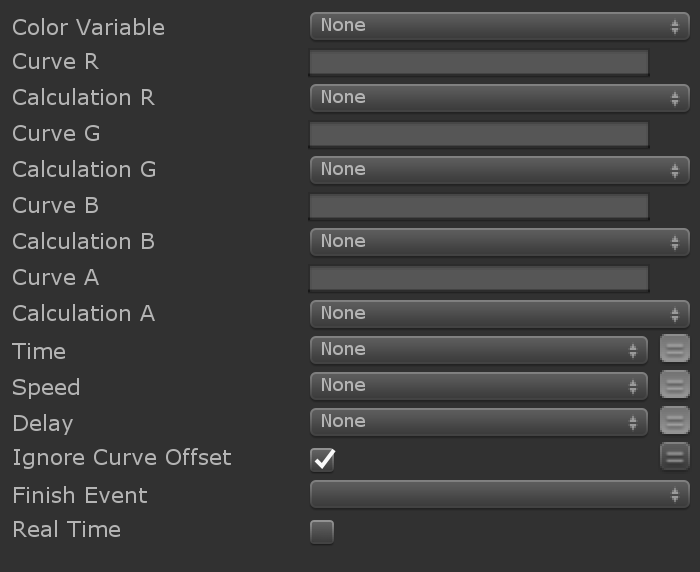 Calculation lets you set a type of curve deformation that will be applied to the alpha channel. Last modified on 6/9/2018 2:45 PM by User.